Hopefully this review does not come out as too disjointed and merely a collection of notes, but regardless, what I think about these books is here. While this is quite late, with the books being sold out almost everywhere and people enthusiastic about the subject probably already own both by now, topics in these books stay relevant and are always open for discussion and debate. Both books will be looked at as basically one, as they are just parts of one whole. Even the page numbers continue from book to another. True to the title, these books cover the camo and markings of Doras from the very first prototype to the last planes captured on film, along with unique characteristics of different manufacturers/assemblies and how these changed as the war neared it's end. While aesthetics are the main focus, they still cover the birth and life of different prototypes, some operational history (Even on gruppe level) and other operations such as repairs. 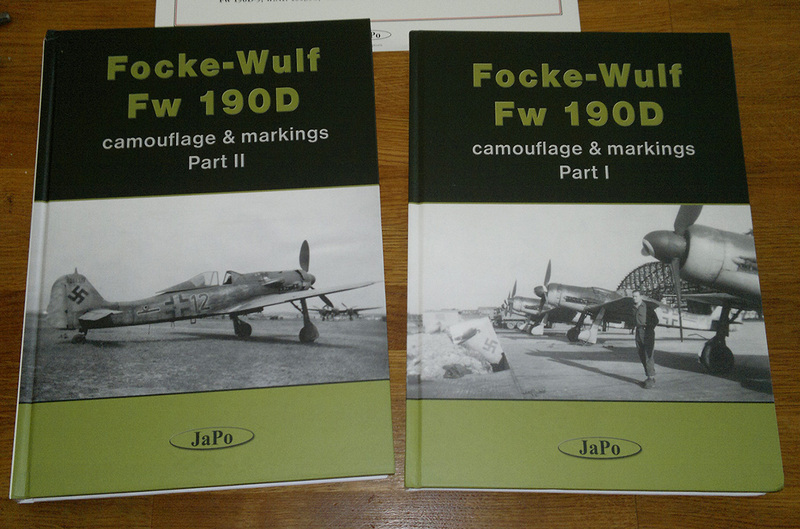 Information and theories here are presented well with support from available documents and photos (B&W, colour and modern photos from pieces of scrap), but especially concerning late-war Luftwaffe camouflage, the norm is more or less well-educated speculation. Of course, all speculation JaPo does is within reason, and the true answer is probably lost forever anyway. Detail is put into covering things such as different types of ID plates used by manufacturers, using pictures of scrap to identify important details and offer additional insight, even to things I'm personally indifferent to. Credit where credit is due. Homever, some things do bother me. Strange decisions were made with some colour profiles. F.ex. "Red 13" of JV44 is extensively covered in photos, but lacks a fully detailed colour profile, while just a few pages earlier, a bird without a single photograph has a full page port-side colour profile. Of course the former is covered in smaller, less detailed quick profiles, but I certainly would prefer to see full profiles for all planes, at the very least ones so well documented. Few colour profiles also seem to be missing details apparent in photographs, although these are minor. For whatever reason, odd lines or descriptions of photographs are included, such as a certain photograph of the "Blue 12, 500570", where an American MP appears to be frisking the surrendering pilot, writing states that how he is "..having his personal belongings "liberated" by an American soldier...". Not only is it irrelevant whether this is true or not (Never explained), in an otherwise nearly academic study this type of pointless and snarky comment sticks out like a sore thumb. Of course, it is possible nothing was meant by it, but it sure annoys me to no end. Just don't do that. Thankfully, colourful comments are kept to minimum and subtitles or notes are mostly used to describe what is not necessarily immediately apparent from a photograph. That is really all I can think to say about "Camouflage and markings", it simply offers everything I expected of it, and more. A wealth of photographs and information I had never seen before, theories and explanations that some I do not agree with, but still got me heavily interested and made me question my own views about the subjects further. I definitely recommend these books to anyone interested in the subject, provided you don't already own both. But they may prove hard to find, and I wouldn't hold by breath for a re-print or e-books. - E-books! For all parts. With detail-oriented material like this, a computer screen definitely defeats a large, heavy book for both research and comfort of consumption.